Freelance writing? Close, but no. I was poking around when I was visiting Singapore 2-3 months ago, casually feeling out what was out there and not quite expecting to actually move to the Lion City. But somehow, someway, fate determined I should be here for now. I love New York with all my heart—it was no easy task getting acclimated to Singapore the first 2ish weeks, considering how often I’ve visited this city the past. I was terribly homesick for my life and friends back in Manhattan and Strong Island. And I still miss New York, but I’m starting to settle into Singapore. It helps that Singapore and Hong Kong are big destinations and my fellow jet setting friends visit often. I was pretty excited about the two magazines back then, even pointing them out to Adrian. 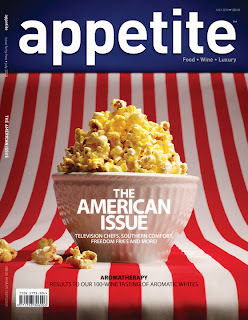 I was impressed (and admittedly surprised) to find out that Appetite was a home-grown magazine. Two thumbs up! 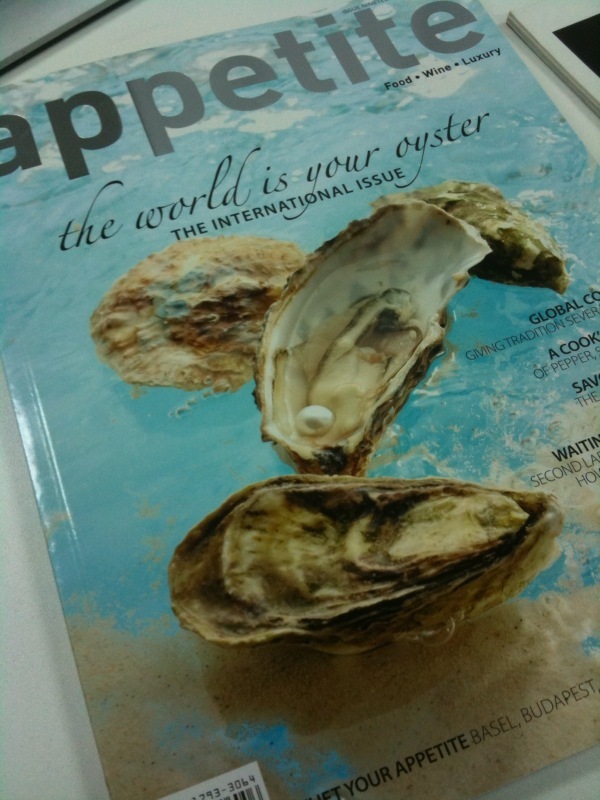 From then on, I always found myself flipping through Appetite and Delicious whenever I was visiting Singapore and had time to myself. As for Gastronommy, earlier this week, I received an email reminder asking whether or not I want to renew this domain. Heck yes! But wow, has it really been only a year already? I feel like I've been doing this for much longer! And I mean that in the best way possible. How appropriate that this July issue should be the first issue my articles appear in. So Happy 1 Year to Gastronommy! 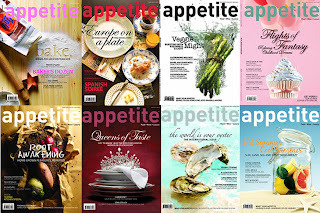 And Happy relaunch of Appetite! 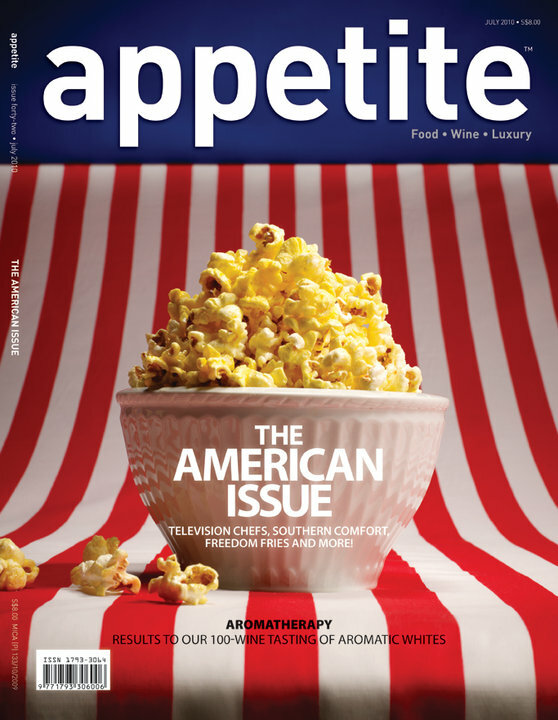 Beginning September check out the new site at www.appetiteasia.com and check out the magazine’s new look on shelves soon. On the question of conflict of interest... I’d like to think that I have a few shreds of common sense and I try my best not to overlap anything and always put work first. To reiterate this blog’s function, it serves as a personal journal of my food related travel, work, eat and play. It serves a very different purpose than most publications. The only real drawback is that I might not have as much time to regularly update for a while... but you can just grab a copy of Appetite from the shelves in the meantime! To celebrate Gastronommy's first anniversary, here's a joke for you. Why did Han Solo cry at the dinner table? Because the meat was chewie. Did we not go over this already? It's Han Solo. No "s"! Whoops. I copied and pasted that joke from Gastronommy's fb. Forgot to edit it again! Congratulations and happy anniversary V! That's really exciting and I will definitely check the site out. I have a feeling that including: "Got engaged? No" was a hint to someone. I actually have a few friends in Singapore. If I visit (when they build the casino), can I drop you a line to show me some good places to eat? Pretender: The casino was built a while ago already! As for the engagement bit, it's hardly that kind of hint. It's more of a hint to my friends to bugger off asking if that is why. And there is nothing wrong with blue.. unless it's under sheer pink. Already built? And the restaurants as well? The one I'd be most tempted to try would be Tetsuya's outpost. Guess I'll put that on the list, though I'm going to HK first in Nov. I just said blue is unappetizing. Have you ever eaten blue food? Blue under pink, so they looked purple?